Hotel investment volumes in the first half of 2016 improved when compared to the same period last year. 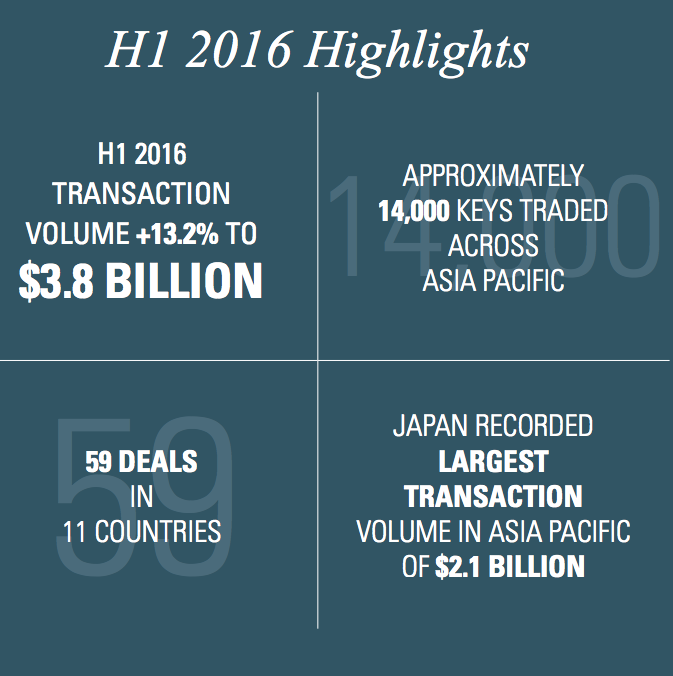 During H1 2016, 14,025 keys traded across the Asia Pacific region, above that of H1 2015 (10,976 keys). In US Dollar terms, the total transaction volume increased by 13.2% to $3.8 billion. What Do Hotel Investors Look For? Hotel initial yields are back to pre-global nancial crisis levels of 2007, and with the weight of capital chasing quality real estate assets, it was anticipated that there would be further compression in hotel cap rates during the course of 2016. However, this was before ‘Brexit’. Despite the relatively sharp pricing in first tier cities, there remains significant appetite from investors for deals in markets with strong domestic and international visitation fundamentals. The top 10 single-asset transactions in H1 2016 collectively amounted to almost $1.7 billion. Japan lent considerable weight to the rankings, representing five out of the top 10 deals transacted during H1 2016. In total, JLL recorded 59 transactions in 11 countries. Across Asia Pacific, the average price per key in H1 2016 witnessed little change, down 2.2% (from H1 2015) to $289K. Asia registered $316K per key (no change) while Australasia fell 18.4% to $193K, a consequence of the Australian Dollar falling against its US counterpart. Overall, domestic investors dominated capital flow regionally, accounting for 80% of all deals above $5 million. 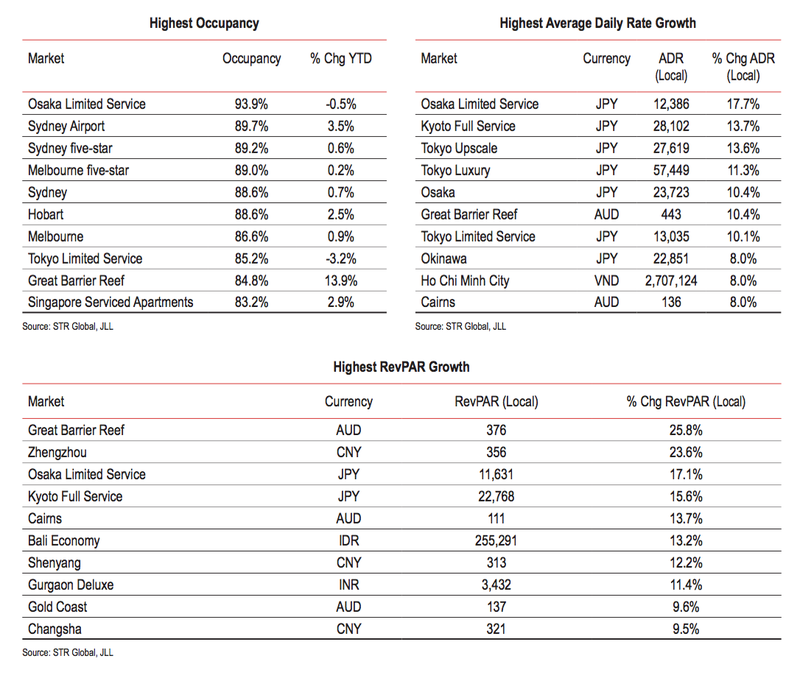 Australasia continues to attract the highest capital inflows with cross border investors emerging as the dominant purchasers of hotel real estate over recent years. Asian buyers are increasingly attracted by higher property yields and the safe haven of proven investment markets abroad. In the booming Sydney market, The Westin Sydney sold for AU$445.3 million. At over AU$1 million per key, this was the first time the ‘magic million’ (per room) figure had been achieved for a Sydney hotel in the post-GFC market cycle. With the property’s heritage, absolute central location and the strength of the Sydney market, interest in the hotel came from both new and existing investors, with bids coming from groups in South East Asia, China/Hong Kong, USA and Europe. it followed the transactions of several other assets including Hilton Sydney, Sheraton on the Park, Sofitel Sydney Wentworth and the Four Seasons Hotels Sydney. With tourism conditions in Sydney at their peak, the potential of the property attracted numerous premium bids, with a joint venture between Far East and Sino Land eventually winning out. One of the most interested groups, Gaw Capital Partners, a Hong Kong-based real estate private-equity fund manager, had an outstanding track record in revitalising iconic hotels, including the Roosevelt Hotel in Hollywood and the Strand Hotel in Yangon, and fully appreciated the potential of re-inventing such a prized property. JLL brokered the sale with a consortium of investors put together by Gaw Capital. The transaction resulted in a deal valued at US$938 million, representing the largest single hotel transaction ever in Asia Pacific and the second largest in the world. At a price per key of US$1.87 million, the sale was the highest ever price per key paid for a single asset in Asia.